When I need to produce a Gum print or a Cyanotype, I sometimes use large format original negatives. More often than not I use copynegs made from an RC print as this gives me much more control and flexibility. The first thing I do is make an RC print to the size that I need my final gum print to be, with all the burning in and dodging that the image requires. I then place that face down on a sheet of either; Lith film, Line film, Ortho film, X-ray film or medical Subtraction film (All of these have different properties, ISOs and contrast, so stick to one and understand how to get the best from it. I would suggest using Ilford Ortho film as it is easy to obtain and works really well). This is placed in a contact printing frame or under thick glass and exposed under the enlarger. 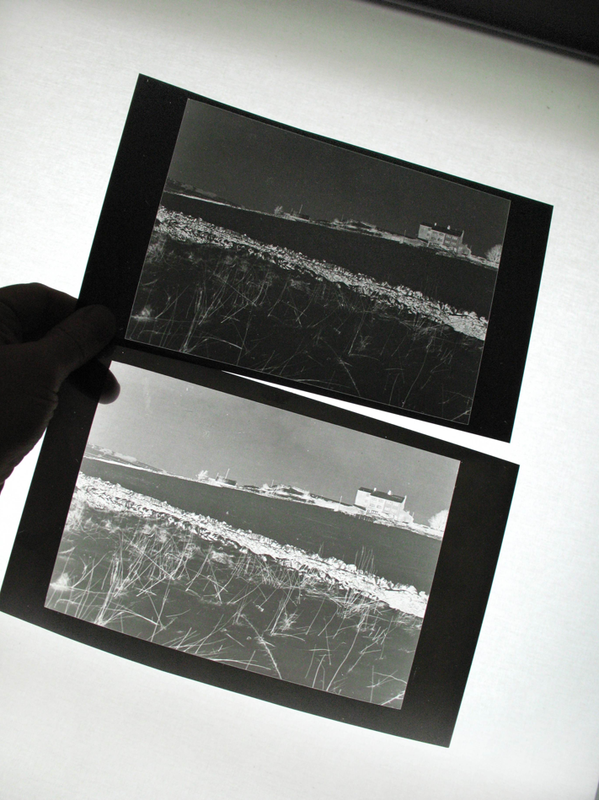 An exposure is given and the film is developed for around 1 minute in paper developer under red safelight (shorter times give lower contrast, -longer times give more contrast). Stop and fix as usual. A 5 minute wash in running water is adequate for these types of film. Be aware though that x-ray film has a very soft emulsion and is easily damaged. To begin with, make a few negatives of varying contrast and density, then when you have become more proficient, you will have an idea which kind of negative works best for the process you are using. I prefer to make two negatives when Gum printing, as this gives me better separation in the tones. The advantages of this method are that you can make a large negative from any size original, you can get the contrast exactly right for your process and you don’t have to worry about damaging your negative when working with the alt process. I also prefer having a large border around my copy negatives, as this gives a better margin for attaching masking tape when re-aligning for multiple printing. Dear Clive, I have not used Arista, but I expect it will behave in a similar manner to the others I have experience of. If you are wanting a longer tonal range, Ilford Multigrade, or similar paper developer will give you this if used at half strength. Experiment with different dev times to get the contrast you require. This entry was posted in Alternative processes, Experimental, Large format, Printing techniques and tagged Alternative processes, Cyanotype, Darkroom, General, gum printing, Large format, Large format negatives, Large negatives, Lith film, Ortho film, Uncategorized, X-ray film on November 25, 2012 by andrewsandersonphoto. Hi Fern, thank you for your message. I have some large sheets of Lith and similar films, but I don’t think I’ll be selling any of mine. Have you looked to see if you can get Maco Genious film in the size you need? It behaves in exactly the same way as Lith film and can be processed in half strength Multigrade paper dev in one minute for a tonal negative. Your other option is Ortho film, which Ilford/Harman still produce.